If you're a racer, a race fan, a hot rodder, a businessman...heck, just about anybody who loves going fast will enjoy Fast Company. 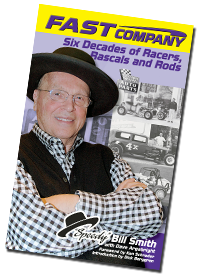 Speedy Bill Smith was an icon in both auto racing and the world of automotive performance, and in this book he shares the great stories and experiences of his amazing, unlikely life. He survived a couple of near-death experiences (literally), parlayed $300 into a performance empire, chased race cars and hot rods from coast-to-coast, rubbing shoulders with countless characters and rascals over the past 60 years. This is an American success story...a little off-color, a little politically-incorrect, and a little over the top. As a car owner, Speedy Bill raced to win, and didn't mind if he got under the skin of his competitors...in fact, he LOVED getting them fired up. Along the way he won too many races to count, made a ton of friends (and maybe just a few who weren't so friendly), and rewrote the record books on many occasions. Over the past ten years, Dave Argabright has teamed up with some of racing's greatest personalities...Brad Doty, Jack Hewitt, Earl Baltes, Chris Economaki, and Doug Wolfgang. You'll find Dave's unmistakable style on these pages, and you'll hear Speedy Bill's voice in every word. Jan Opperman? The real story. Surviving in business? The unvarnished truth about what it takes. Rough-and-tumble racing? Without pulling a punch. Wild and outrageous people? Right here, in the flesh. More than anything, this is a book that will entertain and inform you. No B.S., no sugar-coating...just the world according to Speedy Bill! List price $32.50, direct price $29.95-- SALE PRICE: $9.95!